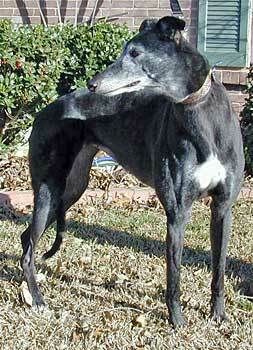 Babe, aka Deco Babette, is a cute 7½-year-old dark (almost black) brindle female born October 27, 1999. Her sire is the famous Molotov and her dam is Marque Alaska. Babe has no races to her credit on Greyhound-Data. She has thirteen pups, four born in May 2003, with the sire being the late Gable Dodge, and nine born in July 2004, with the sire being Dodgem By Design. Those birthin' baby days are over and she is ready to be someone's baby! 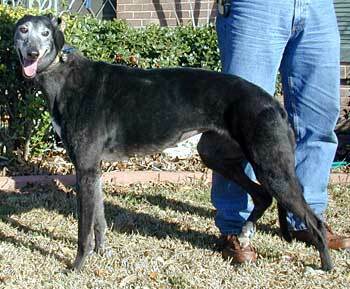 Babe is a quiet, sweet, well-mannered girl, who gets along well with other greyhounds. Babe has had some kind of a previous injury to her back left hock area, which causes her foot to turn a little, but she does not experience any pain and it doesn't slow her down. Babe is not cat or small animal tolerant.